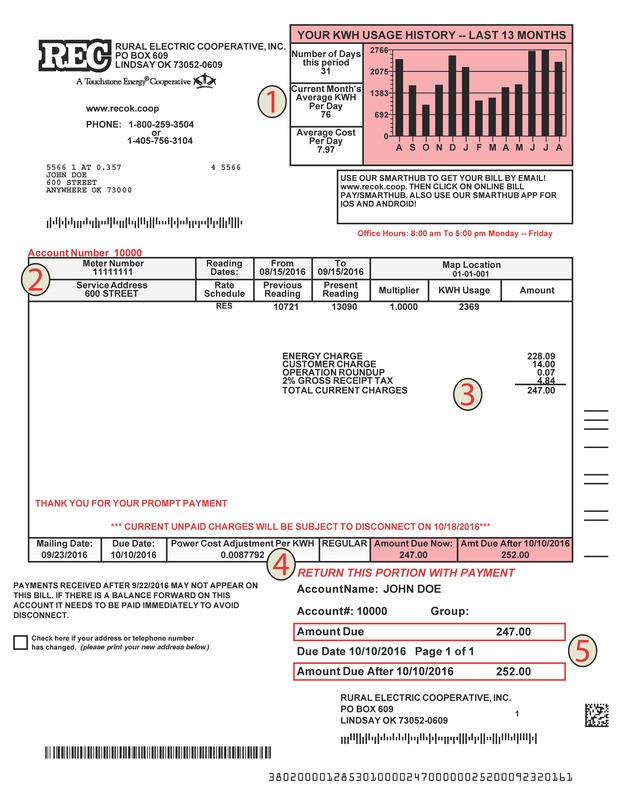 Below is an example of a typical residential bill, along with a brief description of the various components. If you still have questions about the bill, please call our Customer Service Department at 405-756-3104 and a representative will gladly go over your bill in detail. Historical Graph: This bar graph compares the current month’s kilowatt-hour use to that from each of the previous 12 months. Use the data to determine high and low months of electricity use and investigate conservation measures to lower consumption during high-use months. Use the local weather chart to see the correlation between the outdoor temperatures and your energy use. Account Summary: Provides a quick summary, including the account and meter numbers, service address. Each service is assigned a unique account number that is used to pinpoint its exact physical location. Please refer to the account information when contacting our office. Some members have multiple services—perhaps a barn or a well that is metered separately from their home—and, therefore, multiple account numbers. Current Bill Information: Indicates the meter readings used to calculate the kilowatt-hour (kWh) use for the current statement. The detail area includes the energy charges for the current bill as well an itemized list of ancillary service charges (for example, co-op maintained outdoor lights or Operation Round Up®. The energy charge includes a basic customer service charge, which covers the distribution facilities (meters, poles and wires as well as maintenance) and billing and administrative costs; the actual cost of power (kWh usage is multiplied by this figure); the Power Cost Adjustment (see 4, below); and a 2% Gross Receipts Tax, which is assessed by the state and distributed to the local school district in which the tax is assessed. Power Cost Adjustment: This is the difference between the projected fixed power costs (embedded in the base rate) and the actual cost of fuel to generate electricity, which fluctuates monthly. The kWh use is multiplied by this figure and added to or subtracted from the current month’s Energy Charge. Remittance Stub: The lower one-third of the bill is a remittance stub, which repeats important account information needed to process payments. Always return this stub with payments in the envelope provided to ensure proper credit.